and proxy based ideas are used. via integrating of existing services1. in a single composite service. environment, a dynamic WSC approach is required. (PSM), and transformation between them automatically. Jeju Island, Republic of Korea. lution to address this issue. ent characteristics of our proposed method. to support RESTful services as well as SOAP-based ones. used to characterize the entity. rived based on the result model of its previous phase. namicity, and simplicity level of composition process. with each other in order to fulfill the required tasks. input-out put p ara met ers. output parameters of concrete Web services.  Provider: Each Provider provides a concrete service. rated Services each with one function. rithms, which are used in composition phases. ments of the composite service. introduced base model are briefly described. element, which is used in the first part of this model. Figure 3. A sample of IM.GC. executable service, based on the given specification. 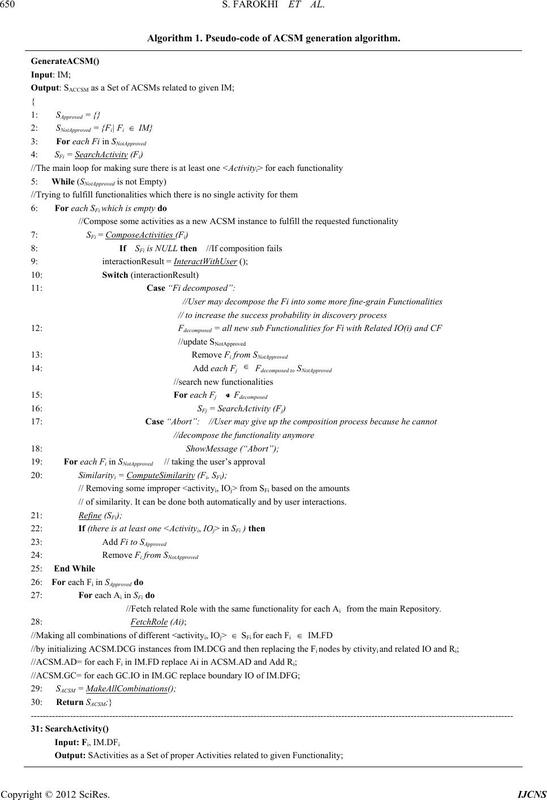 Specification as its input in the format of IM. Figure 4. The phases of MDCHeS approach. set can be edited via user interactions. tion with the user will be necessary. output of Algorithm 1 (line 30). them, a Proxy service is generated to form an EPCSM. each Activity, and then turns ASCM(s) into CCSM(s). to complete this phase, Algorithm 2 has been utilized. Algorithm 1. 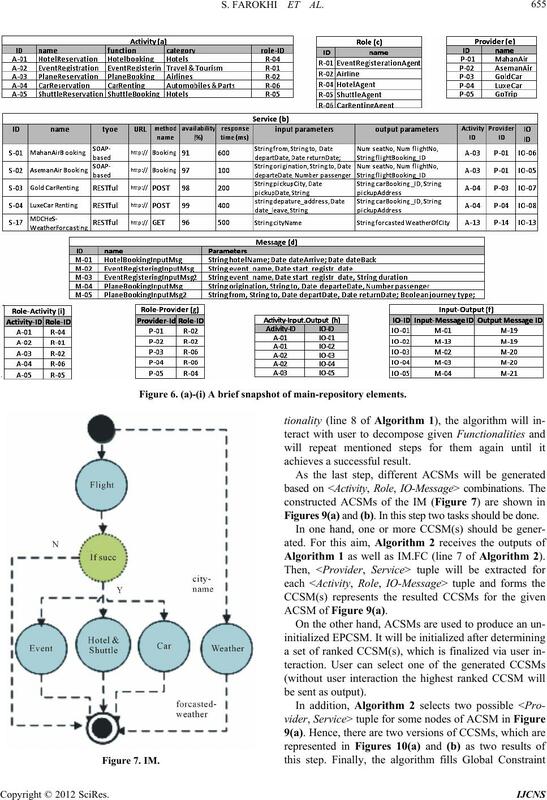 Pseudo-code of ACSM generation algorithm. // of similarity. It can be done both automatically and by user interactions. //Fetch related Role with the same functionality for each Ai from the main Repository. Algorithm 2. 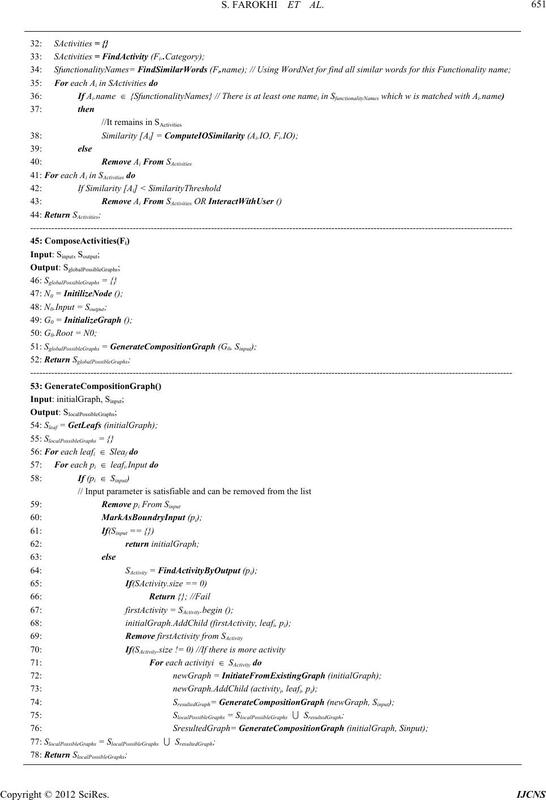 Pseudo-code of EPCSM generation algorithm. 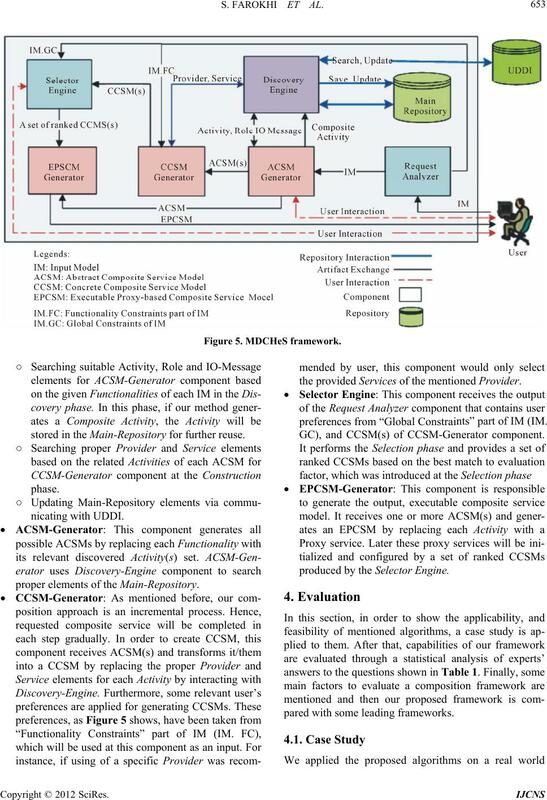 // DCG means Data Control Graph that is in Data & Control Specification part of proposed four models. Updating the ccsmj by these discovered services. // The corresponding providers are added implicitly. //In order to take user confirmation, user's interactions can be made at this time. // In this step for each Activity of ACCSM, a proxy will be initialized based on the best proper service for that Activity. responsible for resolving the interface incompatibilities. which was illustrated in Figure 1.
four models to each other that happens in each phase. stored in the Main-Repository for further reuse. proper elements of the Main-Repository. the provided Services of the mentioned Provider. preferences from “Global Constraints” part of IM (IM. 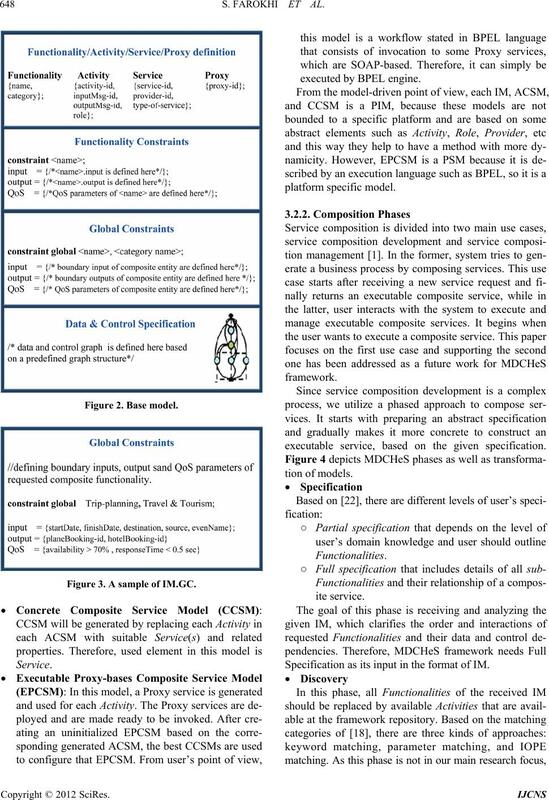 GC), and CCSM(s) of CCSM-Generator component. produced by the Selector Engine. pared with some leading frameworks. Table 1. 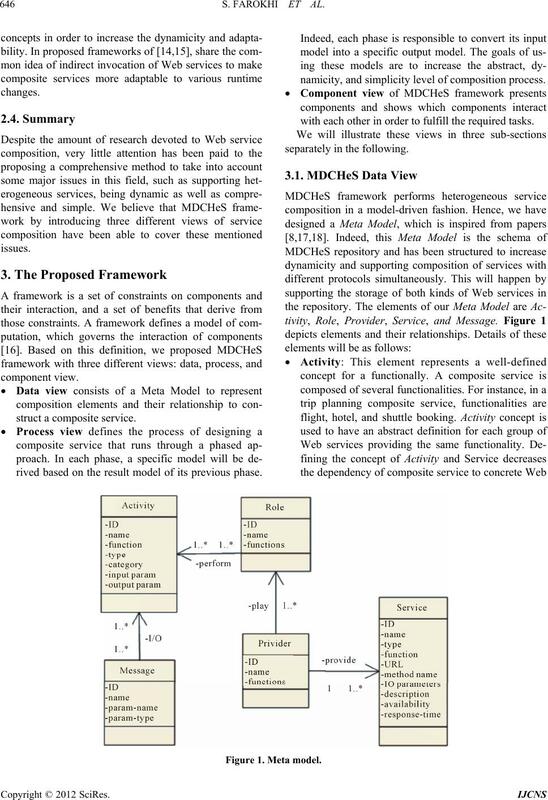 Experts’ evaluation of the MDCHeS framework. cover the relationships among these elements. have not shown inputs and outputs of each graph. 9(a) and (b) show found tuple. message set as input message set of the selected pair. M26> as Figures 8(a) and (b) show. the Functionality as “Approved” (line 19 of Algorithm 1). Figure 6. (a)-(i) A brief snapshot of main-repository elements. Figures 9(a) and (b). In this step two tasks should be done. Algorithm 1 as well as IM.FC (line 7 of Algorithm 2). Figure 8. 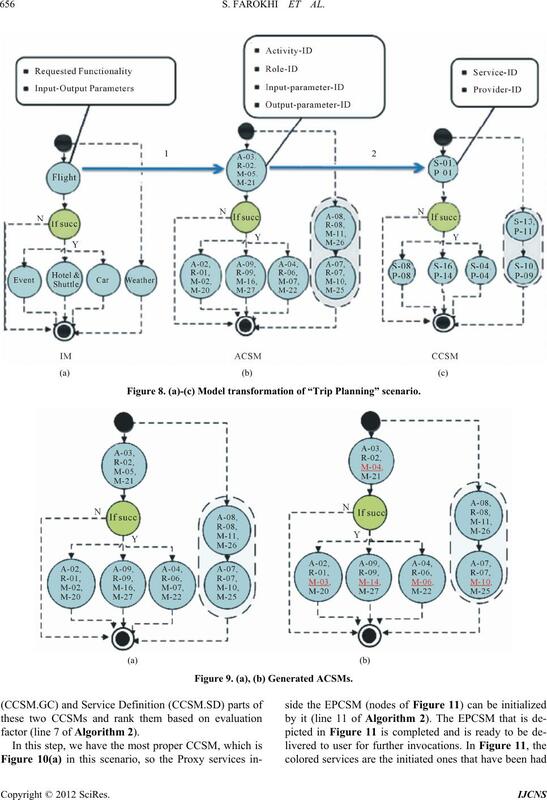 (a)-(c) Model transformation of “Trip Planning” scenario. Figure 9. (a), (b) Generated ACSMs. factor (line 7 of Algorithm 2). Figure 10. 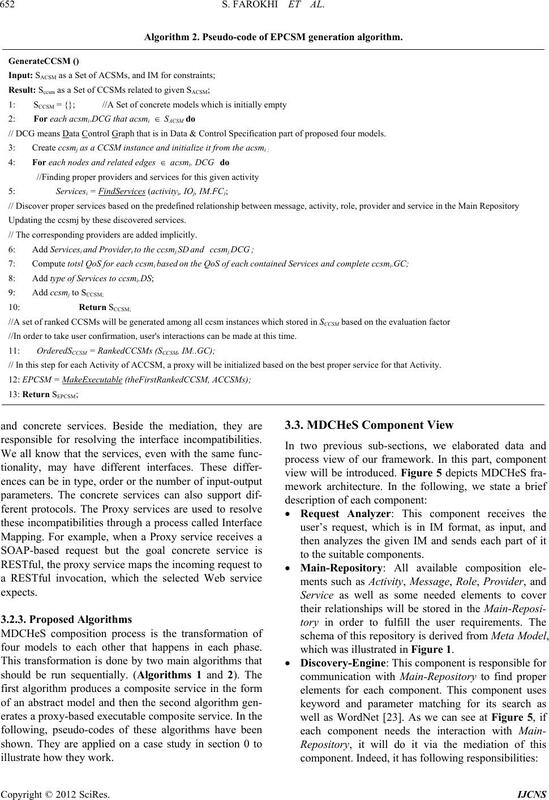 (a), (b) Generated CCSMs. 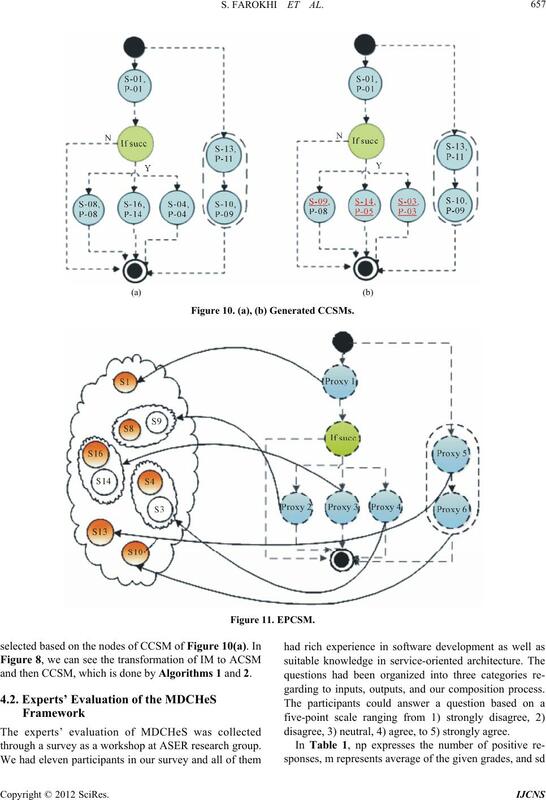 and then CCSM, which is done by Algorithms 1 and 2.
through a survey as a workshop at ASER research group. garding to inputs, outputs, and our composition process. disagree, 3) neutral, 4) agree, to 5) strongly agree. these frameworks will be introduced. ○ Manually that will be done by user. forms service composition in a semi-automatic fashion. to a more satisfactory composite service. 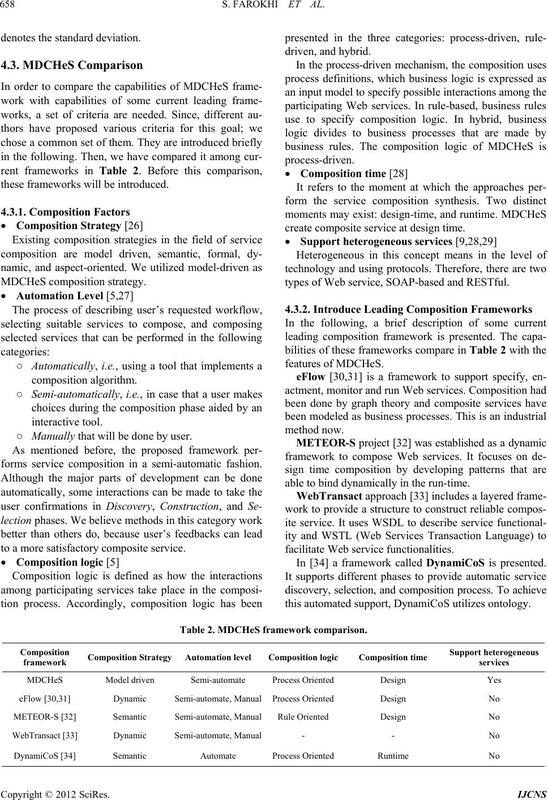 create composite service at design time. 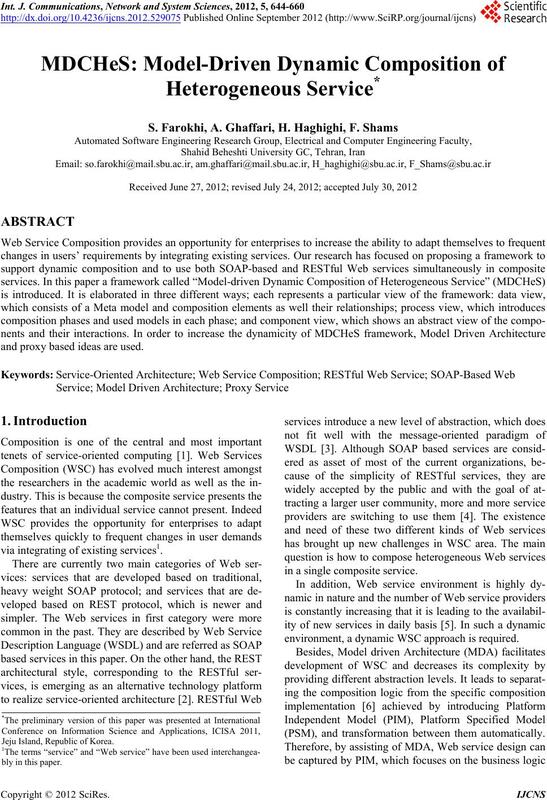 types of Web service, SOAP-based and RESTful. able to bind dynamically in the run-time. In  a framework called DynamiCoS is presented. this automated support, DynamiCoS utilizes ontology. Table 2. 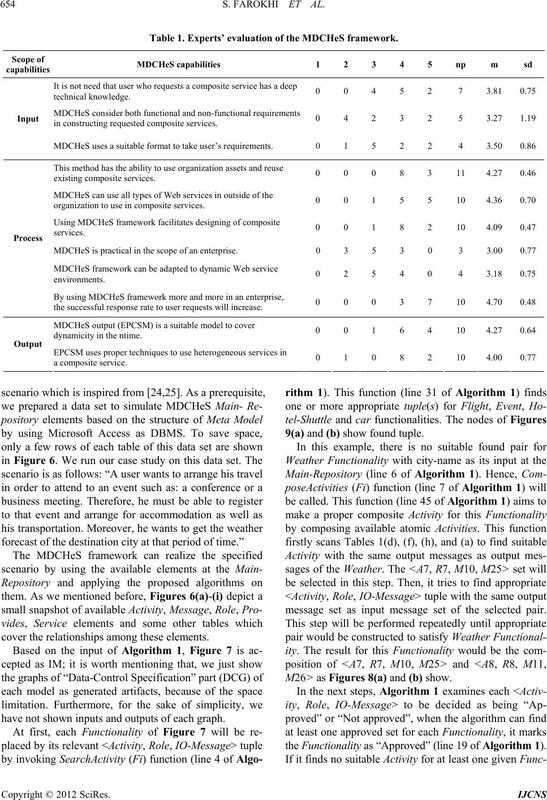 MDCHeS framework comparison. ples that have facilitated its composition process. SOAP-based and RESTful Web services. 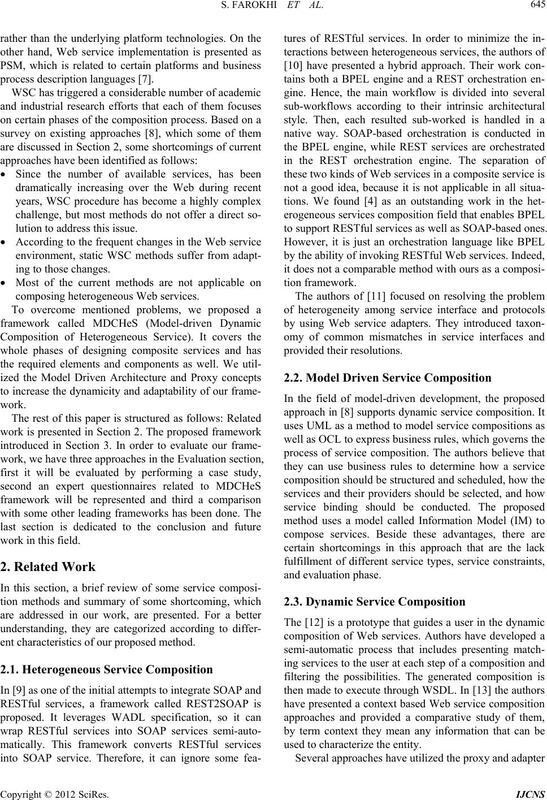 posite service semi-automatically as the output model. phases is yet another future work. and Practices, Idea Group, 2005, pp. 48-66. Composition (SC09), Zurich, July 2009, pp. 142-159.
nal, Vol. 68, No. 9, 2009, pp. 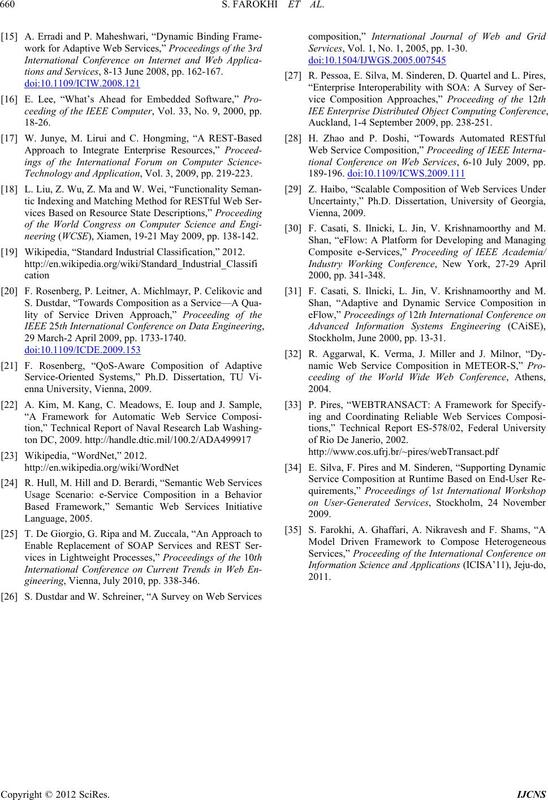 851-866.
agement, Springer, 2008, pp. 278-293.
nology (WEWST07), Halle, 26 November 2007. (ACT4SOC), Athens, 23 July 2010, pp. 67-79. 09), Taipei, 14-15 December 2009, pp. 106-109. Pervasive Computing (JCPC), 3-5 December 2009, pp. 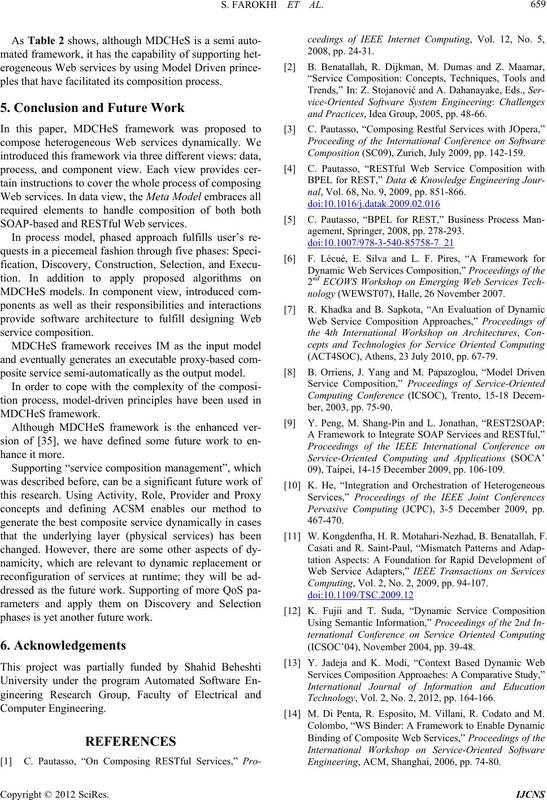 W. Kongdenfha, H. R. Motahari-Nezhad, B. Benatallah, F.
Computing, Vol. 2, No. 2, 2009, pp. 94-107. (ICSOC’04), November 2004, pp. 39-48. Technology, Vol. 2, No. 2, 2012, pp. 164-166. M. Di Penta, R. Esposito, M. Villani, R. Codato and M.
Engineering, ACM, Shanghai, 2006, pp. 74-80.
tions and Services, 8-13 June 2008, pp. 162-167.
ceeding of the IEEE Computer, Vol. 33, No. 9, 2000, pp. Technology and Application, Vol. 3, 2009, pp. 219-223.
neering (WCSE), Xiamen, 19-21 May 2009, pp. 138-142. Wikipedia, “Standard Industrial Classification,” 2012. 29 March-2 April 2009, pp. 1733-1740.
gineering, Vienna, July 2010, pp. 338-346. Services, Vol. 1, No. 1, 2005, pp. 1-30. Auckland, 1-4 September 2009, pp. 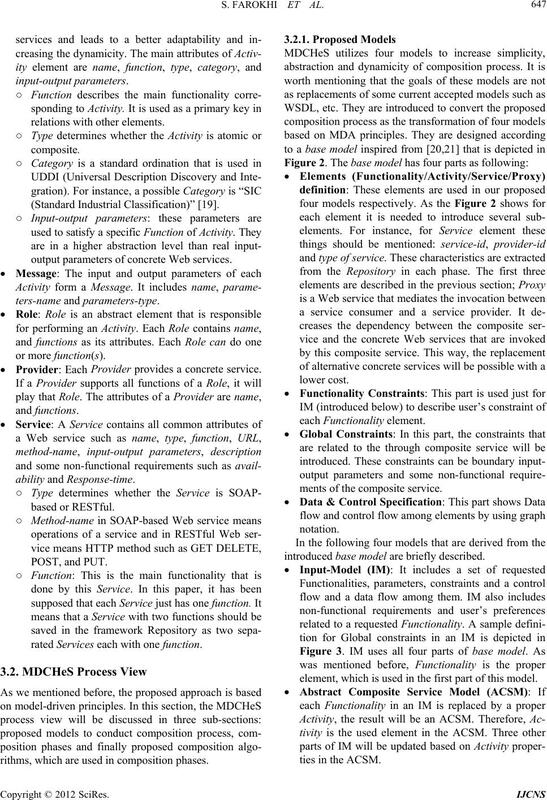 238-251.
tional Conference on Web Services, 6-10 July 2009, pp. F. Casati, S. Ilnicki, L. Jin, V. Krishnamoorthy and M.
Stockholm, June 2000, pp. 13-31.
of Rio De Janerio, 2002.